Give us a quick introduction on yourself and your book. Well, I'm a 27 year veteran of the Army, currently on my third deployment; taking the opportunity to write when I can! I am married, with two children and I enjoy everything from golf, to swimming to computer games. TIME ASSASSINS is my second book and it's an alternate history story with a twist; you know how it ends, but you don't know how it begins. A futuristic assassins guild has time travel technology and they send Assassins back to 'tweak' historical events to make the Earth better. Of course, sometimes it's the lessor of two evils that they have to choose from, and there are rogue elements bent on changing history just because they can. Boredom, LOL. I started writing in Jr. High...I didn't want to act out and get into trouble, so I wrote instead. That carried me through High School when I switched to more of a musical/lyric style. I started writing again on my first deployment to alleviate-you guessed it-boredom. Not to my knowledge. I do try to outline the story, but once I start writing I usually think of more twists, better angles, etc and the book takes a life of its own. I usually start and end where I wanted, but how you get from A to B has never been as I originally intended. I had the title for TIME ASSASSINS before I had a story...I just thought that sounded like a great title. I grabbed my iPhone and left myself a voice memo. Then I came up with the story and it worked out well!! History. I am amazed at how many people don't have a real knowledge of history; so part of why I wrote TIME ASSASSINS was to impart a little historical knowledge on the reader. Of course, its cleverly disguised as an action/sci-fi story so the reader won't be put off by a history text. A lot of TIME ASSASSINS is based on actual historical events and HOURS of research went into it. I studied everything from the Magna Carta, to Hitler, to JFK, to Reagan and Lincoln...and the end result of each event is just like the history books. I just took a few liberties with the timelines leading up to each event. I've read Heinlein, Clarke, Dietz and Scalzi...Starship Troopers is probably one of the best books in my collection. I can relate to the training and the feelings that Heinlein put into the story. I'm reading SECRETS by Dawn Kirby. She is an up and coming author and a talented storyteller. She has woven an intricate web of intrigue into her book about vampires and werewolves...its a great read so far! Tyner Gillies debut THE WATCH was fantastic! I've also got Christine Hughes TORN and Katie Jennings WHEN EMPIRES FALL on my list...in between my own writing, of course. I have almost a dozen different storylines in various states of disarray, but I'm currently working on a sequel to TIME ASSASSINS. It's a little less history and more of a sci fi tale. I am also working on two screenplays for TV; one an adaptation of TIME ASSASSINS and the other a book idea that turned into a great idea for a TV series. Plus a few others...I have plenty to keep me busy! I would love to be able to make money doing this; I have a vivid imagination and think I tell a pretty good story. But, I know that very few people can actually make a good living doing this, so I'm just happy that people are reading and enjoying my stories. That's truly the best part. Nope. Not a thing. It's a great time travel story...read it and you'll see why I wouldn't change a thing! Staying on track. My imagination is on all the time, partly thanks to ADD, and I will come up with a new idea and go with that one for a while...before coming back to my current project. I've been pretty good over the last few months and have been able to concentrate on TIME ASSASSINS II and its coming along nicely! I like William C. Dietz because he write military sci-fi that glues you to the page. He has a real talent for characters and putting you in the thick of the action. I also like John Scalzi because he is one sarcastic and twisted SOB. He is a brilliant writer and has a great imagination. One of my best friends is a very talented graphic designer, writer and voice guy. He has designed both of my covers and they are fantastic. He is already asking to make a cover for TIME ASSASSINS II, but I haven't told him anything about it yet...keeping him in suspense! 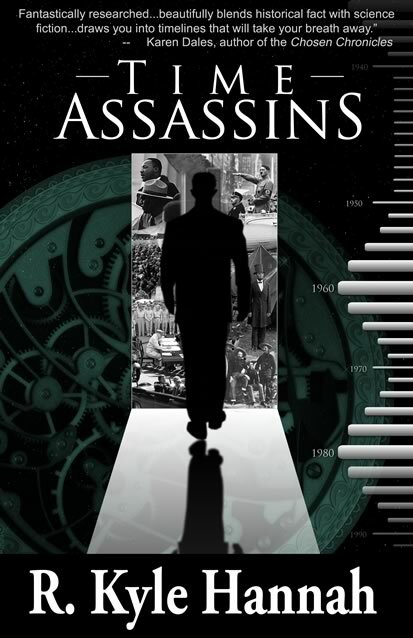 TIME ASSASSINS has a lot of history in it, so I studied each of the events in great detail; I learned more than I ever thought I would about JFK, the War of 1812, and a whole host of Presidents. Write, write, write. Write a story, hire an editor and follow his/her advice. Take that advice and write, write, write...the more you write, the better you will become. Thank you for giving an Alabama boy a chance and please, always leave a review for any Indie Author. Your feedback means a great deal and will make a good writer even better! There was a ton of research in TIME ASSASSINS. Pages of articles printed out, rewrites when something didn't fit into the narrative and great rejoicing when it did! Time was also a factor, it's very hard to get a lot of writing done with a job and family...TIME ASSASSINS took almost 18 months to write. But, I think it was worth it.